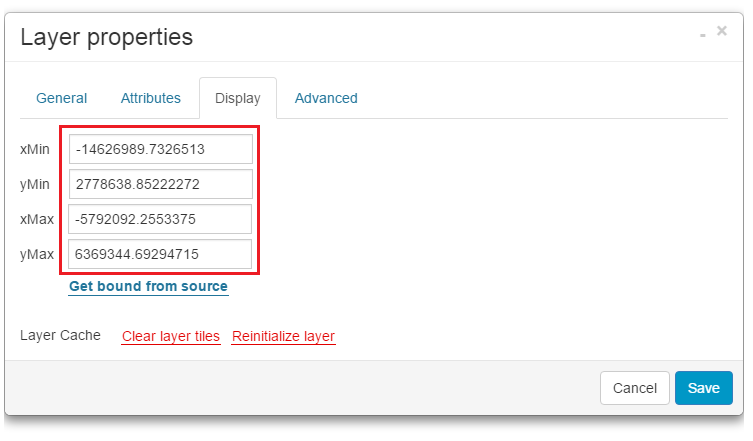 In the Layer properties – Display tab you can set layer bounds or recover your layer if it is not visible on a map. Layer bounds – layer bounding box. Numbers represent bottom-left (xMin, yMin) and top-right (xMax,yMax) coordinate. Features within this bounding box will be visible on a map. In this box you can manually adjust layer bounds. Get bounds from source – automatically adjust layer bounds. Clear layer tiles – if you experience difficulties with the layer you can click Clear layer tiles.This option is usually used after adding a new column in the data grid, after classification or updating layer source. 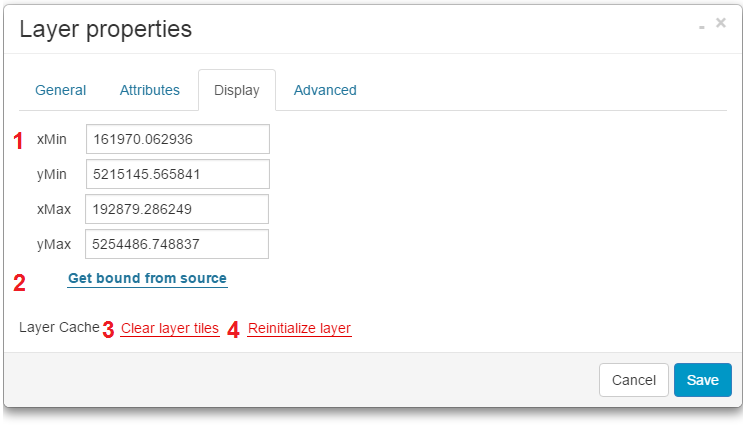 Reinitialize layer – if you experience difficulties with the layer you can click Reinitialize layer. Reinitialize layer is going to reset layer and manually adjusted layer bounds. If original layer bounds are invalid, you can adjust them manually. Please note that xMin has to be less then xMax, yMin has to be less then yMax. All coordinates have to be written in the Google Mercator format e.g. -8111120.4754, 4869191.2638. Open Measure tools and click on the top-right layer bound.